Previously, C9 Entertainment had announced that Bae Jinyoung would be releasing his first single album. It will be released on April 26th. 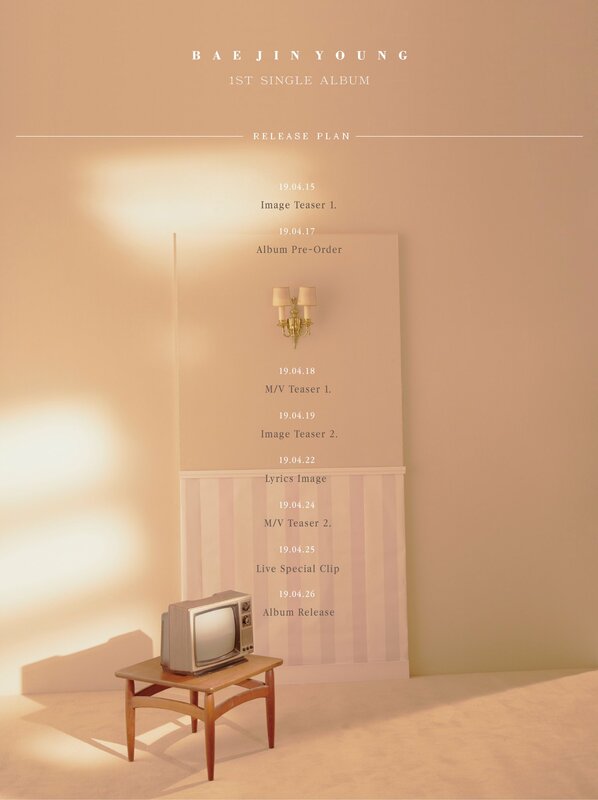 On April 11th, they released his schedule plan for it. Check it out below! Soon, Jinyoung will release two image teasers, pre-order details, two MV teasers, lyric image teaser, a live special clip and the album. Jinyoung has also been announced as the first member of C9BOYZ, which is C9 Entertainment‘s upcoming boy group. Alongside him are his fellow members BX, Yonghee, Hyunsuk, and Seunghun.You might recognise BX and Seunghun as they were previously trainees under YG Entertainment! However, they failed to make the final lineup of Treasure 13 after appearing on ‘YG Treasure Box‘. Fans are delighted to see that they will finally debut soon with C9BOYZ. Bae Jinyoung is the fourth Wanna One member to make an official solo debut. Jisung, Sungwoon and Jihoon have already made their solo debuts. Recently, Minhyun also released a solo song as a pre-release track for NU’EST‘s upcoming full group comeback. Jaehwan and Seongwu are likely to debut soon as they are also holding fan meetings. Seongwu and Jihoon have also been cast in dramas. Meanwhile, Guanlin debuted in a unit with Pentagon‘s Wooseok and appeared in a Chinese drama. Fans are excited to see the rest of Wanna One members’ solo activities. Are you excited for Jinyoung‘s first single album? Let us know in the comments below.